I had never read anything by Maureen Johnson except for short stories she co-wrote with Cassandra Clare. I think she has great potential as an author. But it wasn’t as great as I had hoped. 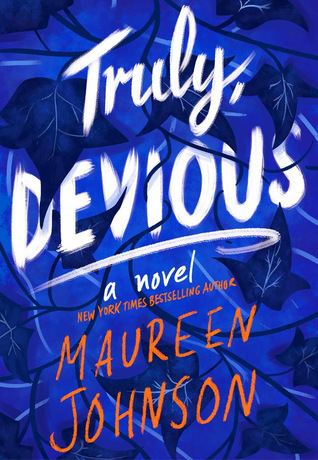 I give Truly Devious by Maureen Johnson three out of five hearts. I loved the first half on the book, the last half not so much. It made me feel really sad because I thought the novel was great until that point. Basically the turning point for me was after the death of one of Stevie’s housemates. The death felt a bit out of the blue and from that point on the story is mostly about that death instead of the initial dissapearance of Alice and Iris Ellingham. I had hoped to get more on the Ellingham case, because I thought it was much more interesting than the death of the side character. It kept me interested in the story in the current timeline because I hoped Stevie would finally solve it. Stevie was a great lead. She is interesting and curious. She is funny and has a charm. I do think she is made more interesting in the setting she is in. It wouldn’t have felt as well done as it was if it had been her at her home, with her parents etc. Because those weren’t very interesting and felt a bit forced in. I would have liked it more if Stevie’s anxiety was a bit more prominent, because it sometimes felt a bit like it was never there. I know in real life it is more like this, but it made me question why Maureen made Stevie have anxiety issues. I was happy the romance in this novel was kept to a minimum. David, Stevie’s romantic interest, is like a wild mouse coast. He has some actions that I question on whether he is a real person or someone who you could call a ‘mirror’ (someone who will looks to be the person you want him/her to be and adepts to everyone and every moment). He was a lot of the times right there were Stevie needed someone to push her in the right direction. Overall I think I will keep reading this series, but I really dislike it when a first part in a series ends with an unfinished story. The story has potential and I am curious on whether Stevie will solve both the cases, the one from the past and the present. This entry was posted in Book Review and tagged Adventure, Contemporary, Maureen Johnson, Mystery, Romance, Thriller. Bookmark the permalink.